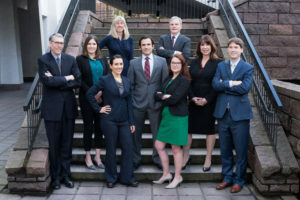 We are pleased to announce that nine attorneys from Lindsay Hart, LLP have been selected to the 2018 Oregon Super Lawyers list. This is an exclusive list, recognizing no more than five percent of attorneys in Oregon. The Super Lawyers lists are published nationwide in Super Lawyers Magazines and in leading city and regional magazines and newspapers across the country, as well as the Oregon Super Lawyers Digital Magazine. Please join us in congratulating Connie Elkins, James McCurdy, Jay Beattie, Michael Estok, Nikola Jones, and Paul Silver for being listed in Super Lawyers and Alice Newlin, Elana Charles and Katie Eichner for being listed in Super Lawyers Rising Stars. For more information about Super Lawyers, go to SuperLawyers.com.